Hi – I’m Vicki from over at Tippytupps: a parenting and lifestyle blog following me, my amazing daughter, gorgeous son, put upon husband and crazy cat. It follows our lives as we try and juggle everything that makes up the world of us! Nicola has very kindly let me take over her blog to talk to you all about our weaning journey – thank you Nicola! Well, myself and my husband met when he was the boy next door. Yep, we are that cliché! I used to live next to his mum and met through her. Fast forward almost 12 years and we are married and live in a little village in North Wales along with our daughter who is two and our son who is currently 9 months old. We’ve gone for a combination of both. I love the concept of baby led weaning but I know in practice a lot ends up on the floor so like to have a little off the spoon too. That way I think he gets the best of both worlds: I know nutritionally he’s getting enough and he’s no hungry, but he’s still getting the chance to play and get used to textures. With both my daughter and son we started ‘first tastes’ a few weeks before they turned 6 months old. This was the right age for Darcie and she slowly ramped up over a couple of months until she was on 3 meals a day. Henry was ready a lot earlier and got to the point where he was nursing 17 hours a day because he was still hungry. I wanted to get as close to that 6 month point as possible though as I believe the advice when it says that their appetites may be ready but their bodies and digestive systems aren’t until they are around that 6-month point. Once he started though he was on 3 meals a day (2 courses each time) within 2 weeks. He really was that ready! I did the same approach both times. 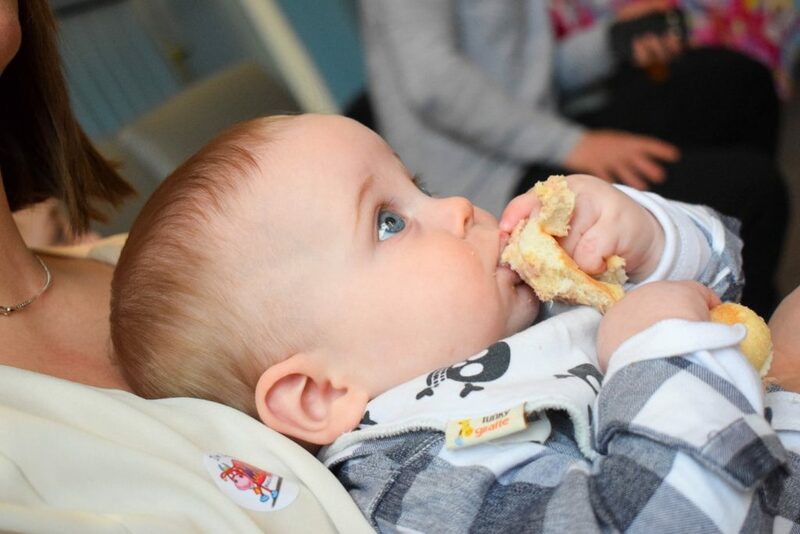 Started with first tastes of food: a slice of cucumber, a little bit of buttered toast, some mashed sweet potato etc. I did this until they were taking enough to constitute a meal which is when I switched around bottles and their feeds. 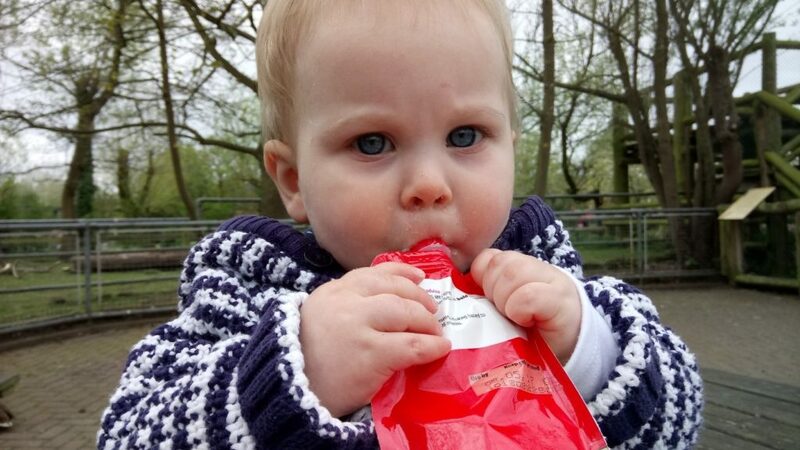 At 9 months old my son now has a milk feed first thing in the morning when he wakes, then food for breakfast, lunch and dinner, followed by a bedtime bottle at 7pm. He will also sometimes have an afternoon milk feed at around 3pm if he wants one. We will be working on phasing this out soon as replacing it with a snack if he needs it. With Darcie, she loved hot buttery toast and still does not at 2 years old. Henry just loves food! His favourites seem to be banana, pancakes and baked beans with mashed potato. There’s not much he doesn’t eat to be honest except sweetcorn which he’s not keen on at all. Pretty much whatever we’re eating. I tend to take a food kit out and about with us which will also act as back up for a lunch and or dinner if we’re caught short out and about. Day to day it contains: a sandwich of some sort, some pancakes, some biscuits (both baby and toddler variety), a bag of pom bears and a couple of fruit pouches. Not a particularly well rounded meal but great for snacks or an emergency! The IKEA Antelop. It was basic, cheap and most importantly wipe clean!! It’s so easy to transport, it has done 2 children and has come on several UK breaks with us so far. I would totally recommend it to other mums and in fact I know people who had other more expensive high chairs but swapped to this one once they realised how easy it was to clean. It depends on the food and the circumstances. With Darcie, she didn’t have any kind of sugar until her first birthday when she had a little or her birthday cake and no take out until she was about 18 months. However, Henry has already had a few chips from my plate and a little of the white fish (no batter!) from our local fish and chip shop. I’m a big believer in everything in moderation. With Darcie, it’s the fact she’s a fussy eater. She got chicken pox on her first birthday, followed by hand foot and mouth, followed by a lung infection in quick succession. 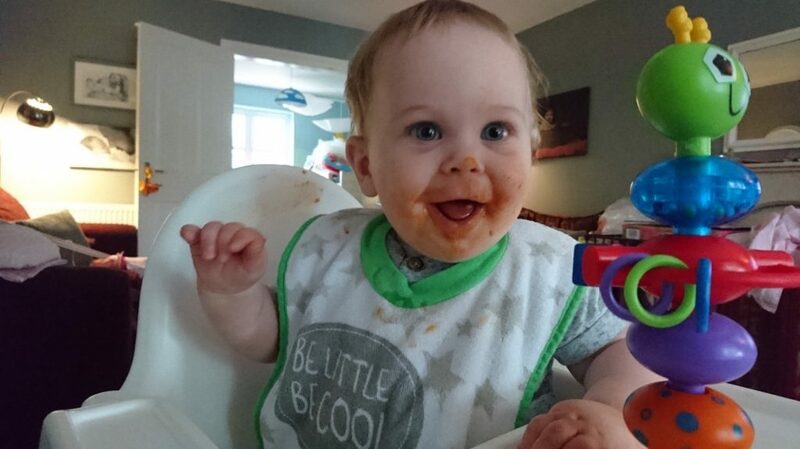 By the time she was back in full health, she became the fussiest of eaters and even now at two will mainly eat potato, pasta and chips! With Henry, it’s the fact he’s taken a step back. He was originally fully baby led as that’s what he preferred. Now though he really prefers the spoon. I think he’s figured out that spoon fed food gets to his stomach quicker!! I guess that’s still baby led as that is what his preference is. I got a lot of comments from the older generation about Henry in that he was ready so give him some food. When I would explain that I was waiting until 6 months there was a lot of “it didn’t do my child any harm” or similar. I also find the die-hard baby led weaners look down on those of us who combination feed which I think is a shame. As mummies, we should be supporting one another regardless of the choices we make in raising our children. Not necessarily meal plan, but there is always a stock of frozen portions of things like spaghetti, stew, casseroles in the freezer ready to defrost if what we are having for tea is not suitable for one or both of the kids. There is always enough food for 3 meals a day available in the house, but what order they are eaten in isn’t planned. Pretty much just the high chair and other bits that come with weaning such as bibs, plates, bowls, cutlery and cups. I use a masher or a fork a lot to break things like potato down into smaller chunks, but nothing that would be classed as a gadget or tool. I don’t think I’d do anything differently as I’ve pretty much taken the lead from them. The approach with both has been pretty much standard but has taken a different route depending on what they like. Darcie went slower but preferred baby led. Henry went straight at it at 100mph and prefers the spoon. Each are different and neither are wrong. Perhaps I could have planned their meals more so I know what they will be having on what days etc. and this is something I will aim to do more of. Especially as there are so many great recipes that I want to try for them but I never seem to have the time! Just to be brave and go for it I think. It can be scary to start weaning, especially if you are starting with baby led but they do know what they’re doing so just go by their lead. They’ll soon let you know if they want more. If you are anxious over choking etc. to the point where you are too afraid to try, then invest in baby first aid training. This will teach you to recognise the difference between gagging and choking and give you the confidence to deal with both. For previous installments of Weaning Wisdom Wednesday click here. I love reading these – it’s funny how you change with your second child isn’t it? I know I’d be more relaxed about the foods they have etc… even though we did the same and avoided sugar and chips etc for well over a year with this one!